Only 60 minutes drive from Geneva and 90 minutes from Lyon, Samoens is perfectly situated in the heart of the magnificent French Alps. Part of Le Grand Massif, the resort is one of 5 ski stations, all linked together : Flaine, Les Carroz, Morillon and Sixt Fer à Cheval. Starting from 1600 meters altitude, there are 265kms of pistes for you to explore, including some unforgettable slopes such as Cascades and the Combe de Gers for the ultimate free ride experience, or the new OASIS PARK for freestyle riders. 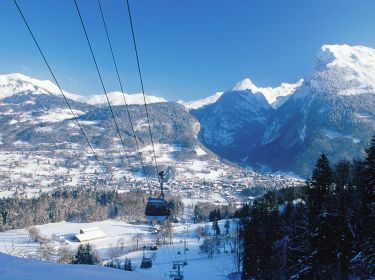 The idylic village of Samoens is situated in the heart of the mountains where you can experience the ultimate ride with spectacular views of the National Nature Reserve.